Attractions/Considerations : There are several tours available from the west side of Tennessee Pass and they are some of the first to get snow due to their high elevation. These trails are maintained and signed by the San Isabel National Forest. Blue diamonds on trees mark the trails. Access from Vail : Travel west on I-70 to Exit 171 for Minturn, Leadville, and Hwy 24. Exit here and turn right (south) onto Hwy 24. Proceed south about 23 miles to the Tennessee Pass parking area across Hwy 24 from the Cooper Hill Ski Area. Old Railroad Run (2.5 miles one-way) : This trail follows an old railroad grade for its entire length. Of interest are the old brick kilns, where charcoal was made from local timber and used to fuel the trains going to Leadville. This is a good level beginners trail. 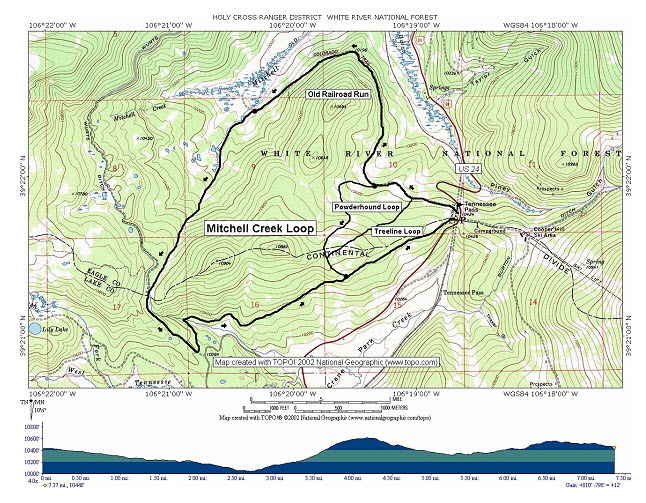 Powderhound Loop (2.5 miles) : This is a short tour up to the Continental Divide. Often holding good powder, it is recommended for the more advanced user. Mitchell Creek Loop (7.38 miles) : This trail follows the Old Railroad Run for 2.5 miles, then turns south and follows the Mitchell Creek drainage uphill through heavy timber and river brush. 1.5 miles beyond the drainage area is a public use tent which provides a nice place to stop for lunch and a rest. Just past the tent the trail follows the Wurts Ditch Road for .5 miles, then returns back into heavy forest of lodgepole pine and back to the original trailhead. This trail offers good views of Chicago Ridge and the Continental Divide, receives only moderate use, and is rated moderate. Treeline Loop (2.0 miles) : Another shorter loop passing over the continental divide for more advanced users than the Old Railroad Run .